The LWF™ wire feeders are semiautomatic constant speed wire feeders. They are designed to be used with the Lincoln range of OPTIMARC™ & DURAWELD™ welding power source. A protected control panel is located in an easy to adjust position in the front of the wire feeder. This control panel is equipped with voltage, wire feed speed, purge and inch control. A rear “panel mount” connects the gas hose and control cable to the LWF Feeder. The welding lug is located on an insulated stud near the rear panel. The family of LWF™ wire feeders are designed for solid and flux-cored wire. A selection of drive rolls is available for various wires of different diameters. The Wire Feed Speed/Current can be adjusted before the arc starting. In that way, the feeder can provide a clean and reliable start with no sticking or spatter. 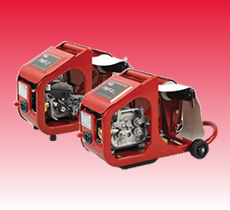 The reliability and portability make wire feeders the ideal choice for various welding application. The PWF™ wire feeders are semiautomatic constant speed wire feeders. They are designed to be used with the Lincoln range of POWERPLUS™ and INVERTEC® welding power sources. A protected control panel is located in an easy to read position on the front of the wire feeder. This control panel is equipped with voltage, wire feed speed, purge and inch control. For easy connection, a rear “panel mount” connects the gas hose and control cable to the PWF™ Feeder. The welding cable lug is located on an insulated stud near the rear “panel mount”. 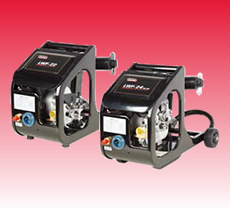 The PWF™-2 and the PWF™-4 are standard reliable wire feeders. The PWF™-2 Plus and the PWF™-4 Plus are fitted with rear wheels /Gun holder /Large radius carry handle and a more robust frame. The family of PWF™ wire feeders are designed for solid and flux-cored wire. A selection of drive rolls is available for various wires of different diameters. The Wire Feed Speed / Current can be adjusted before the arc starting. In that way, the feeder can provide a clean and reliable start with no sticking or spatter. The reliability and portability make wire feeders the ideal choice for various welding applications.